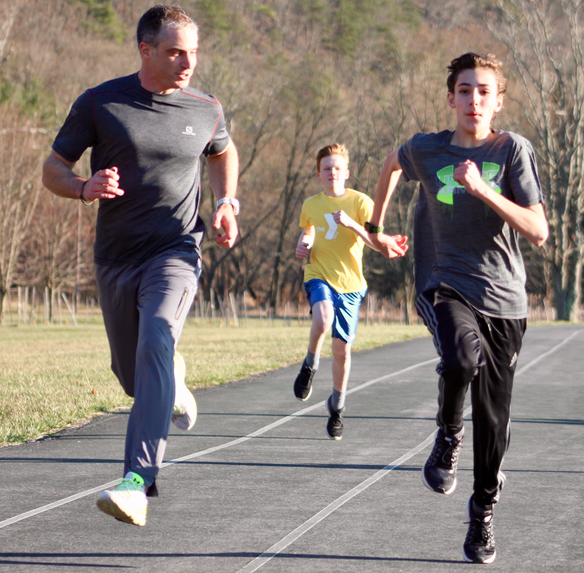 CUMBERLAND, Md., March 23, 2017 — After the first two practices were cancelled due to a mid-March snowstorm, the Antelope Youth Running Club is on the track at Allegany College of Maryland twice a week in preparation for the Spring season. 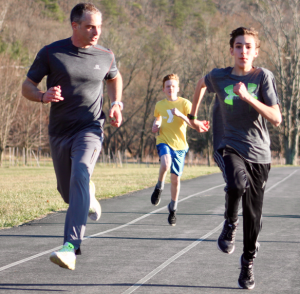 The Antelopes, an affiliate of Howard County-based Bullseye Running, are coached by Justin Taylor with the help of four assistants who specialize in sprints, jumps, hurdles and throws. The third-year group is geared towards boys and girls from kindergarten through eighth grade and serves as an unofficial feeder system for area high schools. The ever-growing roster (it’s not too late to join) includes runners from Allegany, Garrett and Mineral counties. Each week, more than 70 athletes gathered Tuesday and Thursday nights from 5:30 to 6:45 for a warm-up, stretching, plyometrics and a workout that focuses on either endurance (Tuesdays) or speed work (Thursdays). Competitions are mostly on Sunday in April and May. Participation on meet days is voluntary. Registration is $65 for the season for each athlete. For more information, send Coach Taylor an email.